This story’s pretty funny. It’s okay for it to be funny, because nobody got hurt (except for a broken arm, which could be argued that he deserved). 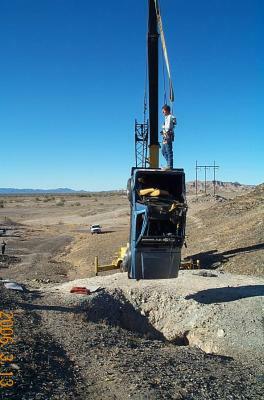 A Jeep gets extracted from the mine shaft it was driven into. And it just reminds everybody to be extra careful in Nevada and Eastern California. You never know where these old mine shafts are going to pop up. They can even open up right underneath you. I remember a few years ago when a forgotten mine shaft in Virginia City caved in right next door to the high school, and swallowed the principal’s car! There’s been enough mining in the area to make the entire landscape of the Great Basin just one big piece of swiss cheese. There used to be a public awareness campaign on TV about it; it featured an open mine shaft with a creepy skeleton standing inside motioning for you to come in. Maybe mine shafts really are doorways to the Land of the Dead. Or maybe they just wanted to creep the hell out of kids and get them to stay away from open shafts. On the other hand, you have to admire the skill of that driver. That’s a tiny little opening he drove into; if he hit it even a little bit sideways the car just would have lodged in it diagonally. He really had to drive into it square on to get the Jeep to go straight in like that. I’m impressed!